The Empath Experience: Is Empathy a Hazard to Your Health? 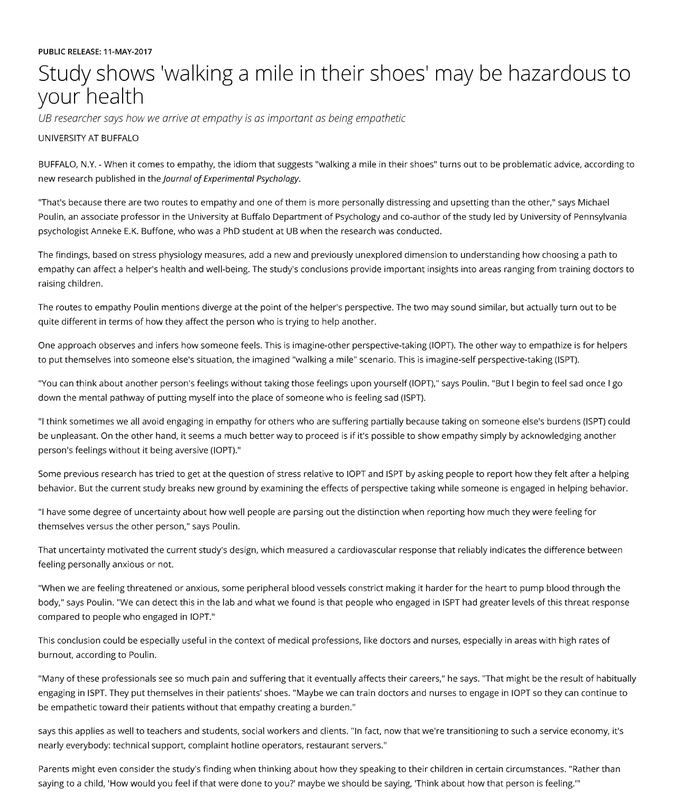 In the Journal of Experimental Psychology researchers found that some forms of empathy are dangerous to your health, while other forms are healthy. This can help us understand empathy more deeply. This study shows that empathy can be dangerous to your health. Let’s explore in more detail the empath experience so see how empathy can be used in a positive way. See if you relate personally or have a loved one or colleague who qualifies as an empath. First, what is the difference between ordinary empathy and being an empath? Ordinary empathy means our heart goes out to another person when they are going through a difficult period. It also means that we can be happy for others during their times of joy. Being an empath, though, we actually sense other people’s emotions, energy, and physical symptoms in our bodies without the usual filters that most people have. We can experience other people’s sorrow and also their joy. We are super-sensitive to other’s tone of voice and body movements. We can hear what they don’t say in words but communicate nonverbally and through silence. Empaths feel things first, then think, which is the opposite of how most people function in our over- intellectualized society. There is no membrane that separates us from the world. This makes us very different from other people who have their defenses up almost from the time they were born. Empaths share all the traits of what Dr. Elaine Aron has called “Highly Sensitive People” or HSPs. These include a low threshold for stimulation, the need for alone time,sensitivity to light sound, and smell, plus an aversion to large groups. It also takes highly sensitive people longer to wind down after a busy day since their system’s ability to transition from high stimulation to being quiet is slower. Empaths share a highly sensitive person’s love of nature and quiet environments. However, empaths take the experience of the highly sensitive person much further. We can sense subtle energy, which is called shakti or prana in Eastern healing traditions, and absorb it into our own bodies. Highly sensitive people don’t typically do that. This capacity allows us to experience the energies around us in extremely deep ways. Since everything is made of subtle energy, including emotions and physical sensations, we energetically internalize the feelings and pain of others. We often have trouble distinguishing someone else’s discomfort from our own. Also, some empaths have profound spiritual and intuitive experiences which aren’t usually associated with highly sensitive people. Some are able to communicate with animals, nature, and their inner guides. But being a highly sensitive person and an empath are not mutually exclusive: you can be both at the same time.